Covello & Covello Historical Photo Collection. 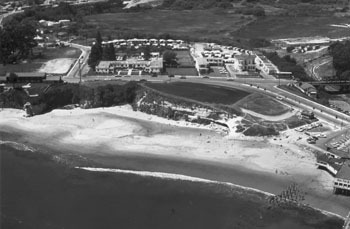 Cowell's Beach, 1960: You can see the remaining piers sticking up from the old railroad wharf. You can also see the Sisters' Hospital, which relocated a few times and finally ended up being Dominican Hospital. The Ideal Fish Restaurant is also down there somewhere. GAS BOYCOTT. There's not too much we can do, but Tim Seidl, award-winning fashion designer, forwarded a plan that's now happening all over the United States. Since we can't do without gas, then for the rest of this year boycott just Exxon and Mobil. If they see their business dropping, then they drop prices. Then it seems obvious that other gas companies will have to drop their prices, etc. I agree it's a long shot to hope that kind of boycott will change the way oil companies and OPEC nations plot, but how big a sacrifice is it to not buy at Exxon and Mobil stations? SLUGS AND STUDENTS. Once again UCSC and Cabrilho students are going to be welcomed back by a revived tradition known as the Slug Fest. It'll happen south of Cathcart Street on Pacific Avenue as it used to, and as in days of yore, there'll be lots of bands. Plus this year there'll be martial-arts demos, a fashion show including wild hair stylings, a karaoke competition and things like that. It's happening on Sept. 29 from noon to 6pm. Neal Coonerty and I used to stage these gala happenings in the Gateways Books parking lot, starting around 6pm, with hundreds of students and lots of music and plenty of food booths. We'd emcee and ask historical Santa Cruz questions from the flatbed truck stages and give away hundreds of CDs and T-shirts, and everybody would have a great time. It's a fine tradition, and congratulations to all the South Pacific folks who are working on it. If you and your friends want in on this gala, call the Volume Store at 457.9262 or email [email protected]. THINK ABOUT THIS ONE. The Cabrillo Stroke Center up at De Laveaga Park will be moving into new campus quarters in a couple of years. The city has asked its department heads to come up with ideas on how to use this great facility. I've been there: it's got office space, classrooms, a gym, a view and no neighbors except for the 911 headquarters next door (and it's all earthquake-proofed). I know there isn't a chance in hell Santa Cruz would devote this fine place to the homeless or low-income folks or some hardworking community organizations, but maybe it's worth giving your favorite City Council person, if you have one, a word or two about what you think. GREAT FLUORIDATION NEWS. The Vol. IV #1, Winter 2001, issue of the California Fluoridation Now newsletter tells how Modesto will now provide fluoridated water to its residents. Miguel Martinez of the Dental Health Foundation told me that the San Francisco Public Utilities Commission voted unanimously to create an East Bay fluoridation station. This means that soon all water users in San Mateo and Santa Clara counties--including the cities of San Jose and Milpitas--will have fluoridated water. That's a total of 460,000 new happy, healthy teeth people. The newsletter goes on to tell how important it is for seniors to have fluoridated water--that's according to the National Institute on Aging. In another article, they call California children's dental disease an epidemic because they have twice as much dental disease as the national average. They name fluoridating community water as the number one step to halt that epidemic. Some members of the California Fluoridation Task Force include the UCLA Department of Pediatric Dentistry, the UCSD Medical Center, the UCSF School of Dentistry, the USC Department of Dental Medicine and Public Health and the California Dental Hygienists Association. GOOD-BYE, LEE QUARNSTROM. Lee and his wife, Chris, are moving to Orange County pretty soon, just after he retires at the end of this month. There's going to be a farewell party at Chaminade (they donated the space) on May 18. There'll be newspaper-type toasting and roasting. There will also be a marathon discussion of what's wrong with the San Jose Mercury starting at 5pm. Messrs. McLaughlin, Woolfolk, Rogers and other hangers-on will preside. Due to the omnipresent poverty level of media types, there'll be a $15-$20 donation per person laughingly titled the "Send Lee to Orange County" fund, but it's really for the food. Email [email protected] for details or if you feel the need to express yourself in some overt declamatory style. MORE POLITICS. It's widely known and also printed in the Democratic Central Committee's newsletter that former Santa Cruz Mayor John Laird will be running for the State Assembly 27th District. Some Democrat from Monterey apparently is running against him in the 2002 primary. The newsletter also sez that the Republican candidate may well be Marc Monte of Aptos, who changed his party affiliation in October 2000 just in time to be seemly. It'll be amazing if Marc does run. Rarely have I had so many people so anxious to share damaging items from the past as I hear each time that Monte is rumored as a possible political candidate. Believe me this could prove to be a nutsy election if it happens. DARK PLEASURES AND CABLE. When moviegoing gets so bad that The Return of the Mummy is the biggest box-office hit, and the tired spy spatter The Tailor of Panama is all there is to attract mainstream filmgoers, cinema is in trouble. This is the time to watch non-network TV. Cable channel Cinemax West showed Lars von Trier's The Idiots last week. Von Trier films aren't for everybody. The Idiots had people racing out of the theater at the Cannes Film Festival, and you can see why, but yet, but yet, Then there was the documentary 101 Rent Boys, about the male prostitutes on Santa Monica Boulevard--that was on Cinemax, too. Last Friday, the Independent Film Channel screened Amateur, a 1994 Hal Hartley film starring Isabelle Hupert and Martin Donovan. It was about a murderer who had short-term memory loss, like the new movie Memento. COUNTERPUNCH. I have next to zero respect for anonymous emailers. For obvious reasons, the fluoride issue brings them out a lot. "Joe," who is one of those, did, however, send me something worth repeating: the email address of CounterPunch Magazine. This magazine, partially an online publication, features some absolutely absorbing articles. One is titled "The Bombing of Big Sur," by Alexander Cockburn, whose name and reputation should need no credentials around here. He tells of the history of the Hunter Liggett real estate, the historical value, the cultural importance and the insanity and the very real bombing danger if the army succeeds in starting its practice bombing runs. By accident, I also got involved in reading a very critical article against Ken Burns' Jazz series, also in that issue. The article and the many letters to the editor that followed say a lot of what my jazz enthusiast friends and I felt about Burns' series. The article also goes a long way into the dubious role that Wynton Marsalis has created for himself in the jazz world and why there's so much objection to his narrow views on jazz. Read www.counterpunch.org, but only if you like to think a lot. BUMPER STICKERS AGAIN! I saw these three around town. The first was DILLIGAF, and I darned near rear-ended the guy's bumper trying to read the fine print to see what "dilligaf" meant. I cared because I'd seen it in many places. It means, "Do I Look Like I Give a _uck." The next was "Trying To _iss Off the Religious Right." The last was on a Nissan; it said, "Never Underestimate the Power of Stupid People in Large Groups"--and you know who you are. Bruce critiques films every other Thursday on KUSP-FM (88.9) at 12:50pm. Reach Bruce at [email protected] or 457.5814, ext. 400. From the May 9-16, 2001 issue of Metro Santa Cruz.